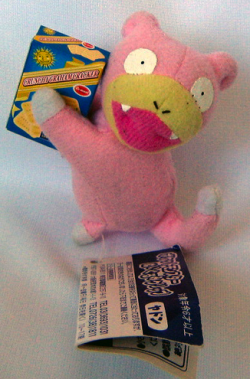 This is one of the last Slowpoke plush I need before my official plush collection of him is complete! 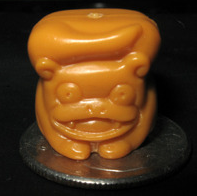 He's about 2.5" in height, and originates from Japan; I'm not sure what year he is from, but it seems he's quite rare, as I've never seen one before. I would be very fortunate to find one with both its' tush and hang tags in tact. 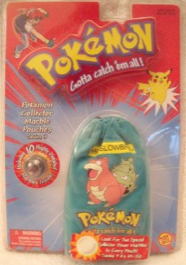 I'm still on the hunt for this one, but it was released in 1998, so I'm not really sure when it'll come up or where! I don't expect to ever find it, but it's one of the most adorable tins I've ever seen by FAR. 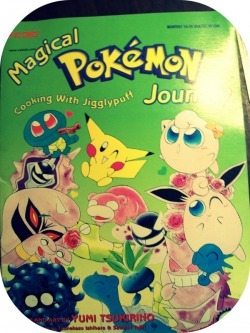 Seems like this book is from Japan, so I'll have to keep my eyes peeled on Y!J. 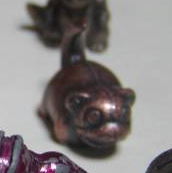 I'm not sure how many shades that Slowpoke exists in the metal collection figures, but the only one I have is the green (and it's my favourite so far out of all of the ones I've seen!). I think there may be 5 or so, but I'm hoping to collect them all. Metal Collection Figures are one of my favourite pieces of merchandise, since they're detailed, unique (I'm normally used to seeing plastic figures, not metal), and heavy for their size! This one is like the others, except gold! 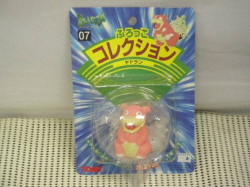 I got this picture from someone's collection update (I'm unsure if they even collect Slowpokes! ), and decided to add it here. I'm pretty sure these are all fairly rare since they're from maybe 10ish years ago? This picture is from lazer's collection; I think she's had these for a while now. 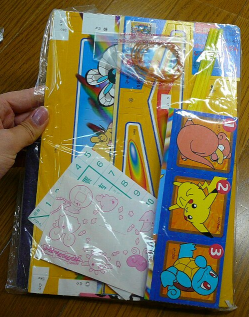 This is such a cute scene for a Pokemon puzzle! Anyway! 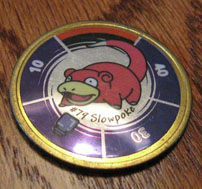 I'm mostly interested in Slowpoke, however I'm aiming to find the entire puzzle rather than just the few pieces that Slowpoke is in. I've seen this on Y!J a couple times, but wasn't able to bid on them. Maybe I'll get lucky again! 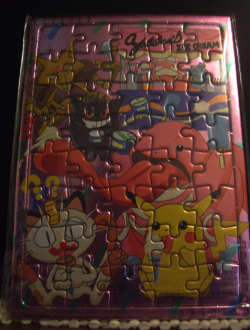 I've only seen this puzzle come in holographic; I have the picnic one from this series, with Slowpoke & the onigiri. 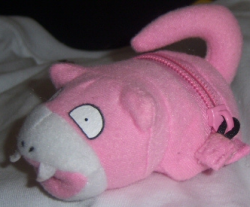 I'm pretty sure this one looks JUST like the Slowbro keychain I have with the detachable tail, but in green, and without the keychain. I'm suspecting that he's missing his shell, but I have yet to see one with its' shell attached! Those things come off pretty easily, anyway, and most 'bros don't have theirs anymore since they're old figures to begin with. 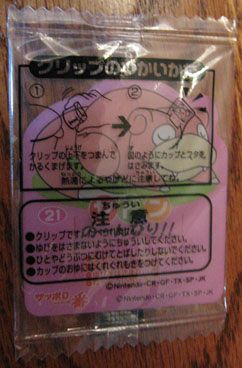 The biggest giveaway that he's a Slowbro and not a Slowpoke is his tummy patch with the stripes. 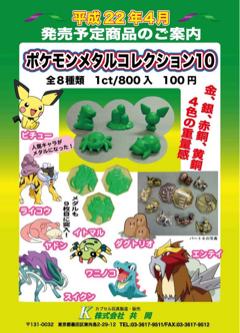 I've seen teal figures of this kind, but I'm unsure if Slowpoke comes in that colour. 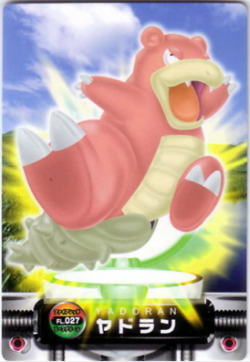 I don't even know what this is, but I've never seen Slowpoke in a pose like that before! 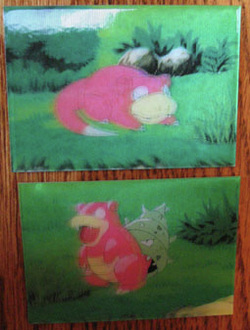 Maybe I'll find just the part with Slowpoke sometime? 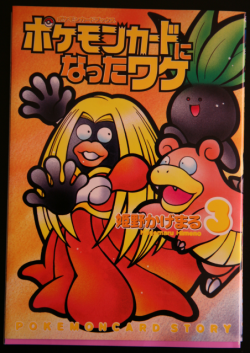 I'm not even sure what it is; he's numbered with Pikachu an Squirtle, 1-3 respectively. Is it maybe just a piece of paper? Stickers perhaps? As dizzy as I'd get from looking at these, I still want them lol. There is also a purple one just like this, but I haven't seen any other colours (though, teal seems to be the most common). This was taken from Y!J, however it isn't a high want (generic poses lol). This little guy appears to be pretty rare; I haven't seen him being sold at all! This picture was from someone's personal collection, who was kind enough to give me a close-up of him standing on top of a quarter. These guys are TINY! I'm thinking this one is about the same size as the purple one I have, just brown (and in a different pose, too!). This one looks a nice solid opaque green just like the mini model, but it has the same pose as the chibi model! I'm unsure how big these actually are, but I'd love to have him in my collection someday. Recently I've also discovered that this same figure comes in a gold/champagne metal figure (maybe that's from the picture on the middle to rightish area? It's very hard to tell! ).